INIFD are always considered to be the most challenging domain in terms of retaining creativity and individuality. 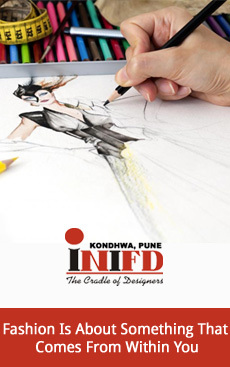 At INIFD, we have a three dimensional approach to design its courses viz. innovation, creativity and technical skills to provide the students with a sound career launching pad which makes us different from other INIFD Fashion Design Academy. INIFD Fashion Design Institute means students will be taught the basics of computerized pattern making technology, flat pattern drafting, sewing, draping, interior lay-outing skills, color schemes, jewelry art forms and the list goes on. These courses are designed with the prime focus of making the students well versed with rudimentary concepts which gradually will lead them to hone more refined skills that will help them understand the finished product. Today INIFD has left an indelible mark in creating talent pool in its campus which gives us a distinct place among all other INIFD Pune Academy. After spending time with INIFD (depending on type of course one selects), a student will not only make an assured rewarding career but also will be able to make a value addition to the domain(s) he is moving and will ensure a significant place in the corporate ladder.